I have a couple of older Mac Pro desktops that I tend to. As my machines usually get upgraded to the max, they’re still pretty darn useful. Currently they’re all Dual Quad Core 3Ghz / 16G Ram 1,1->2,1 flashed, which is more than enough for dev purposes. Sadly though, they still have the original graphics cards – rather crappy 7300GT’s. 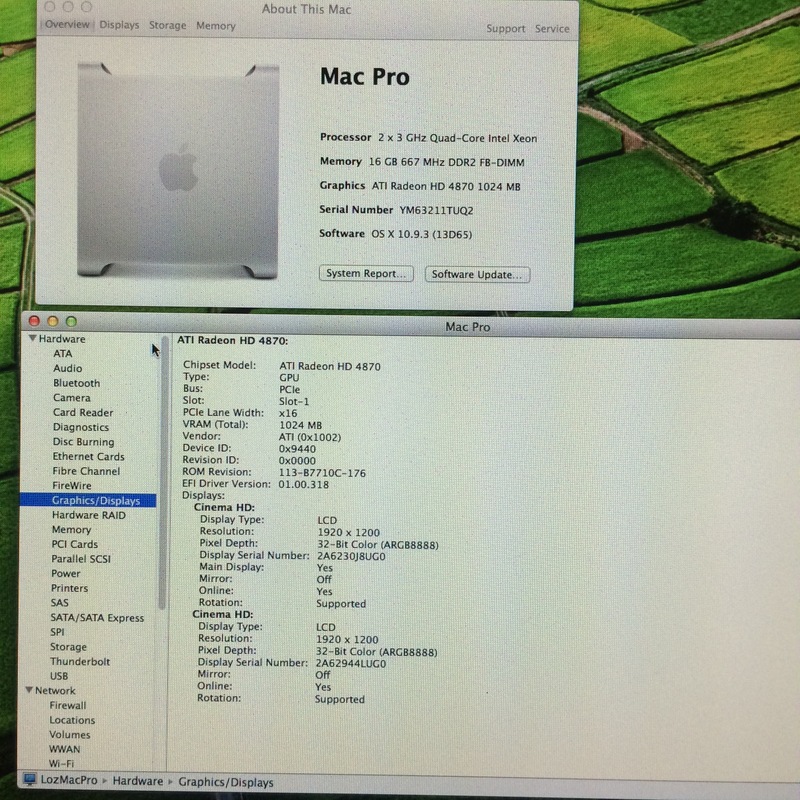 One of the issues with the Mac Pro 1,1 is that in Yosemite* the original graphics cards aren’t really supported. *Sure Yosemite isn’t really supported either, but it does work after a bit of EFI boot mangling. You can work around things, by having a newer NVidia card (i.e. 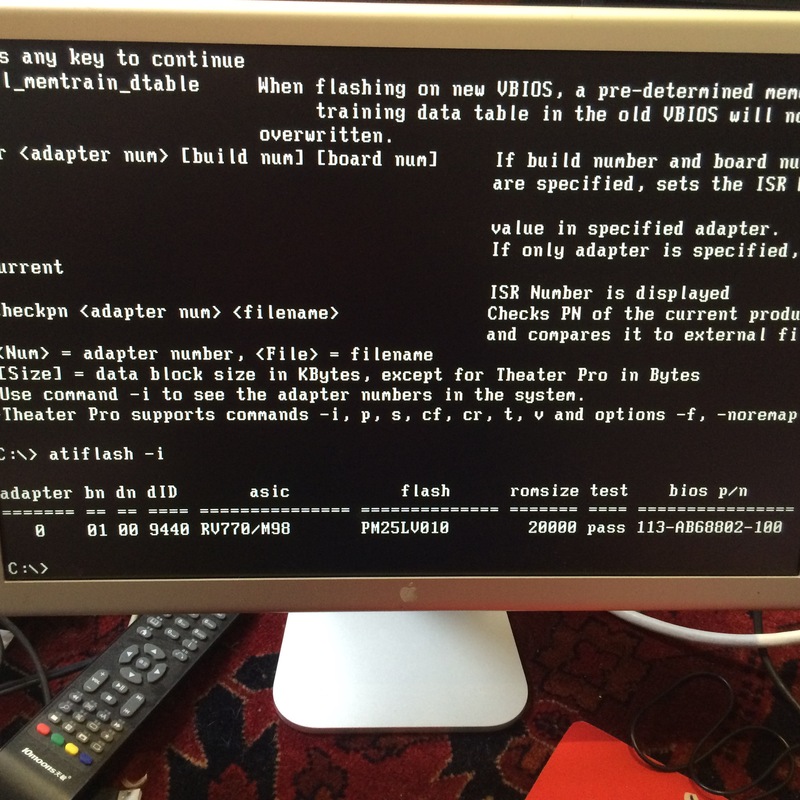 anything 6XX and above), but then you lose boot graphics till the OS loads drivers. As I sort of quite need boot graphics due to the bootloader side of things getting borked on occasion, I thought I’d source myself a compatible card. There aren’t really that many options unfortunately for vintage equipment, its mostly 8800GT’s that are at least 5 years+, and priced at silly money. There are other options though – certain PC graphics cards are usable. 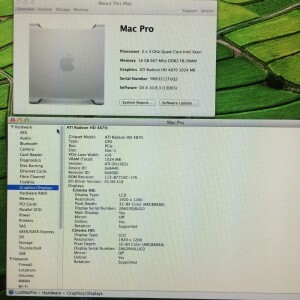 #1 – Shipped on a Mac Pro 1,1 or 2,1 (so that AMD created an _EBC_ based Mac BIOS). 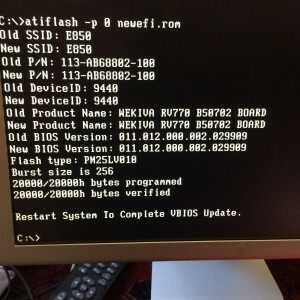 #2 – Has a flashable BIOS. This rules out most of the NVidia’s of that era, so its a select number of ATI cards. Netkas.org is a good source of reading for that sort of thing. So, sourced myself a 4870 1G card (235RMB w/shipping), and set to work. There is a wealth of information out there about flashing, but unfortunately all the links appear to be pretty dead. The general consensus is to dump the original firmware, then patch it yourself. There are tools for this, but they don’t really work. Cindori’s Zeus et al.. I tried to do this inside the Mac Pro itself, but it wasn’t having any of it, and didn’t like the perfectly fine DOS USB key(s) I made. Luckily I also had a Windows box available to dump / flash. Fun and games with PSU connectors later, I booted off a DOS boot disk, used ATIFlash to dump my original rom, then shutdown again. 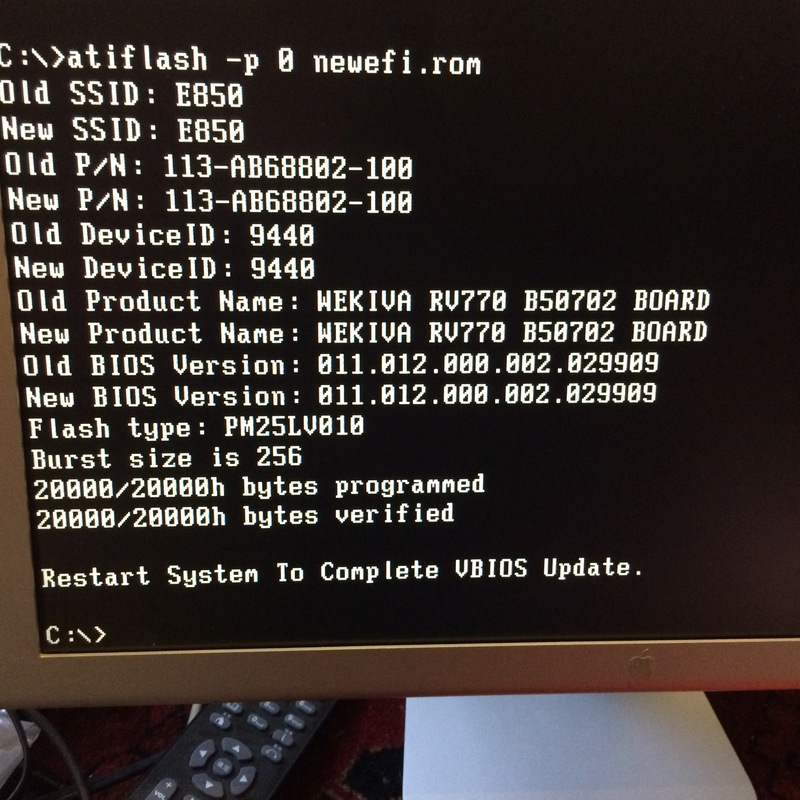 Copied the patched rom back onto the USB, rebooted off again into the DOS boot disk on my Window box, and flashed the new patched EBC rom bios. A few minutes of recabling later on the Mac, I got a nice boot screen off the card. Works fine in OSX too (sleep etc appear to be fine). Its specifically for the 4870 card I have, so don’t randomly flash to your 4870 card, unless the part number matches. My P/N is below.